Samsung has finally revealed the next Galaxy Note series phone to the world and with it the most monumental evolution of the phablet’s iconic S Pen we’ve seen to date. Outfitted with Bluetooth support and its own battery, Samsung hopes that the Galaxy Note 9 S Pen will change the way we use the retractable stylus forever with a potentially endless list of remote-use features. Following such a dramatic overhaul, we thought it’d be fascinating to look back at the history of the S Pen for Galaxy Note smartphones to see how it transformed into the beloved multi-purpose pen we have today. This is the evolution of the Samsung Galaxy Note S Pen. Built in partnership with Wacom, the original Samsung Galaxy Note S Pen was 14mm long and packed 256 levels of pressure sensitivity. The lightweight stylus, which handily retracted from the Note’s bottom edge, was ostensibly there to act as a more accurate input method than your average human finger for tapping images, swiping through your apps, scrolling a web page, and all the other motions you might use to get around the bold new phablet’s UI. The “smart” part of the “S” in the original S Pen came via the side-mounted button that would become a mainstay of Samsung’s pop-out pen for years to come. The original S Pen cemented its place as an essential part of the Note brand we know and love today. As well as gesture controls that let you effectively ignore the Note’s keys completely, the S Pen’s handy button let users take quick and easy screenshots that could then be scribbled all over. A double tap of the stylus alongside the button, meanwhile, brought up the S Memo feature for more detailed note-taking. There was also a handwriting-to-text feature that was far more accurate than you might expect for a phone released back in 2011. None of these features outshone the phone’s other main selling points — most notably that (for the time) massive 5.3-inch display — but it nevertheless cemented its place as an essential part of the Note brand we know and love today. Bigger, badder, and more productive, the S Pen’s sophomore appearance brought with it a raft of key improvements that helped convince many doubters that Samsung’s diminutive stylus was more than a mere gimmick. The second S Pen was a tad longer and slightly thicker than its predecessor, had a larger rubber tip to feel more like an actual pencil, and quadrupled the max pressure sensitivity to 1,024 for more precise inputs. The biggest addition, however, was Wacom’s fancy digitizer tech which made it so the Galaxy Note 2 could sense the S Pen being close the to screen without physically touching it. Samsung took advantage of this with a new feature called Air View, which let users see small, pop-up previews of messages, documents, photos, and even videos when hovering over icons. Aside from the hover inputs and the notable jump in accuracy overall, the main enhancements again focused on that magic button and the Note 2’s expanded, S Pen-enabled app suite, including the ability to cut and paste any part of the screen, and the introduction of Quick Command — a tool of writing shortcut codes to send texts, search the web, and more with just a few sketched symbols. The Galaxy Note 3 — a.k.a. the one with the awkwardly stitched faux leather back — was overall a case of iteration over innovation, but that wasn’t true for the S Pen which enjoyed further improvements. While the pressure sensitivity remained the same, the S Pen’s design underwent a drastic overhaul and now featured a squarish, symmetrical design. This meant you could now store the S Pen in its slot without having to fiddle around for the right side. The biggest and best change, though, was the addition of the Air Command menu, which brought the main S Pen functionality together in a single, half-circle menu that would appear any time you ejected the stylus. Powered by TouchWiz and Android Jelly Bean (and later KitKat), the Command Window offered instant access to S Pen-ready apps and features such as S Finder (a powerful internal search tool), Action Memo (a more intuitive take on Quick Command), and Autodesk’s Sketchbook app for those looking to get creative on the go. Thankfully, for those that were turned on by the Note series but turned off by the price, Samsung released a stripped-back version of the Note 3 called the Galaxy Note 3 Neo. Despite an overall drop in power, the Neo came with all of the same S Pen features found on its premium counterpart. Most consumers and critics, including former Android Authority superstar reviewer Joshua Vergara, agreed that Samsung hit it out the park with the Note 4. Coming off the Note 3’s iterative improvements, the Note 4 went whole hog with some major upgrades, especially the S Pen which once again notched up the pressure sensitivity, this time to 2,048 which was double the Note 3’s total. The best new feature was undeniably Smart Select which made it possible to select text on a website or document. This made the S Pen truly feel like a PC mouse for the first time as you could copy and paste lines of text with just a few gestures and taps of the S Pen. Another handy feature was Photo Note. This let stylus-wielders clip individual parts of a photo and then copy, morph, and share them with a few swipes. You can see both this and the Smart Select feature in action in the video above. All of these features, as well as the returning Air Command menu, also made their way to the Galaxy Note Edge — a more expensive version of the regular Note 4 that added a curved display edge on the right side. Let’s start off with the bad, or at least the stupid. Shortly after its release in late 2015, some Galaxy Note 5 users managed to get their S Pens stuck by inserting it into the phone backwards. This issue — dubbed “Pengate”— was rectified with a spring mechanism that was added to later models, but Samsung’s ‘you should’ve read the manual’ defense upset a few Note users. Right, now that’s over with. Let’s get to the good stuff as the Note 5’s stylus was otherwise a huge step up over its previous iterations. After years of constant additions, the S Pen arguably came into its own with the Note 5. The most obvious change came in the design stakes with a ballpoint pen-like pop-out top in place to help users pull out the pen which now sat flush to the phone’s body. On the software front, Samsung took the necessary decision to strip out much of the unnecessary features from its S Pen-ready suite and kept the best tools such as S Note, Screen Write, and Smart Select, all of which received minor tweaks. The Air Command menu also went through a design overhaul to match Samsung’s then custom skin TouchWiz’s new look and less bloat-heavy aesthetic and added the option to edit which apps appear in the menu. After years of constant additions, the S Pen arguably came into its own with the Note 5 all thanks to Samsung’s decision to focus on the aspects were the most useful and jettisoning those that were superfluous to the everyday user. Sorry, Samsung. You may want to forget it ever existed, but it did. Putting aside the whole ‘the phone exploded a bit’ issue, the Note 7 was actually notable for introducing a handful of S Pen upgrades that quietly became the standard on future, less-combustible models. For starters, Samsung upped the S Pen pressure sensitivity once again to a whopping 4,096 and kitted it out with water resistance, making it feasibly possible to whip up a drawing underwater or, as was likely more common, use the S Pen in the rain. 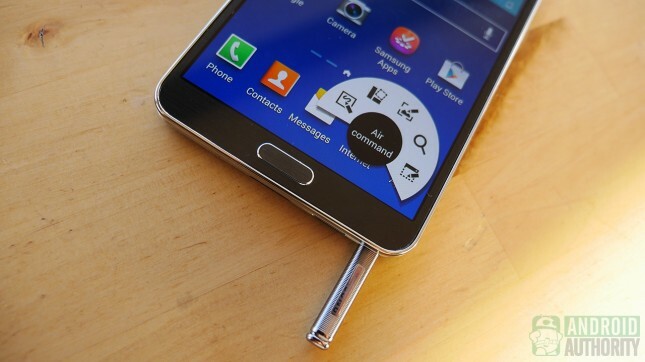 You also now couldn’t put the S Pen in the phone backwards, so no more “Pengate” problems at least. The Note 7 was notable for introducing a handful of S Pen upgrades that quietly became the standard on future, less-combustible models. Software-wise, the Note 7’s S Pen suite once again centered on the three main pillars: Notes (a new one-stop app for all note types), Screen Write, and Smart Select each of which received minor improvements. The most notable was Animation select for the latter, which let users record 15-second GIFs by drawing out a frame with the stylus. Elsewhere, the Air Command menu gained a further three new features. Magnify let users zoom into parts of the screen by up to 300 percent, Glance shrunk down commonly used apps to a tiny square which could be checked at any time by hovering over it with a pen, and Translate incorporated Google Translate into the S Pen’s hover repertoire for translating single words. The Samsung Galaxy Note 8 was/is a beast of a phone that inherited the Galaxy S8’s Infinity Display and all-glass design and combined it with the Note range’s unique feature set. The fusion of the two culminated in what is debatably the best Note series smartphone of all-time. Despite the major design shift elsewhere, Samsung took a relatively cautious approach and kept the design and basically functionality of the S Pen in tact. The notable changes came in the software department where productivity was once again a key focus. Translate could now translate full sentences and not just individual words, while the Pen-Up coloring app was included as standard as the latest de facto drawing app. Screen Off Memos — notes that can be drawn on the lock screen that were first introduced on the Note 5 — could now be pinned to the always-on display as constant reminders. There was also the addition of Live Message for making animated GIFs out of recorded stylus text, effects, and images to share with friends and family. It’s fair to say that Samsung’s focus on the Note 8 drifted away from the phone’s marquee feature, but after so many Note fans having missed out on the myriad S Pen upgrades from the Note 7 there was enough to satisfy most buyers. Here it is. After a year in the shadows, the Samsung Galaxy Note 9 S Pen represents an evolutionary milestone for the storied Note series’ pointy pal. The introduction of Bluetooth LE (Low Energy) support is a revelation, letting users utilize the S Pen as a remote control for all manner of regular smartphone functions. These include opening the camera, switching between regular shots or selfies (and taking snaps, of course), control music playback, flip through presentation slides, and much more. You can read more about all these features here. For those worried about the addition of a battery, Samsung has promised that the S Pen will charge in just 40 seconds when docked in the phone and will last for up to 200 clicks at a time or 30 minutes on standby thanks to a built-in super capacitor. The most exciting part of the S Pen’s newfound Bluetooth skills, however, is that we’re only just scratching the surface of its functionality. Samsung is opening the SDK of the S Pen in the near future, meaning app developers will be able to integrate S Pen interactions with any suitable third-party apps and/or games. Aside from all of the returning features seen on the Note 8, the other notable change to the Note 9 S Pen is the color. The ocean blue variant’s contrasting bright yellow S Pen has been the star of all the marketing so far and it’s not hard to see why. All in all, the Note 9 S Pen is the next logical step in the stylus’ progression. We can’t wait to see where it goes next. What do you think of the S Pen’s journey so far? Are there any features you’d like to see that Samsung still hasn’t implemented after all these years? Let us know in the comments. Deal: Samsung Galaxy Note 9 is only $700 for next six hours — Get it fast!